Summer signing Lee Erwin has yet to make a first team appearance for United and says he would be happy to go out on loan – but only for the long term benefit of himself and the Whites. Phil Hay reports. The signing of Lee Erwin will not come cheap when a fee for his transfer to Leeds United is set by tribunal. The club took him in the knowledge that compensation owed to Motherwell would run to a sum of around £500,000. That outlay suggested that Erwin would make waves at Elland Road this season but four months on from signing his contract, he and Leeds are in agreement that a move on loan would do him good. When Uwe Rosler spoke on Friday about sending out a player for “development reasons”, he admitted that Erwin was someone he had in mind. The injury suffered by Chris Wood last week – an injury Rosler refused to discuss in detail, apart from saying that it seemed to be minor – might delay the exit of a forward like Erwin but Leeds appear intent on blooding the 21-year-old further down the Football League. Erwin would happily take that step after failing to find a way into Rosler’s first team. United’s head coach named him on the bench five times last month but did not find an opportunity to give Erwin his debut. Erwin has been less involved again since the season’s first international break, limited to involvement with the club’s Under-21s. He scored two goals in a 3-3 draw with QPR’s development squad at Thorp Arch yesterday, striking twice in the space of one second-half minute. Erwin was always seen by Leeds as a long-term project. Owner Massimo Cellino, who personally pushed the transfer from Motherwell through in June, revealed at the outset that Erwin’s early months in England might be spent on loan with another club, particularly once a fee of more than £2m was invested in Wood’s move from Leicester City. Wood has four goals to his name this season and Antenucci has three. Between them, the two forwards have led Rosler’s attack in the Championship. Souleymane Doukara, who also played and scored for Leeds’ Under-21s yesterday, has made three league appearances as a substitute but neither he nor Erwin are getting a seriously look-in. Erwin confirmed that Rosler had spoken to him about the possibility of leaving Leeds on loan. “Yeah he has but I really don’t know what’s happening,” Erwin said. “I’ve asked but we’ll wait and see. “I’d enjoy going out on loan if there’s no chance of me playing first-team football here. Once you get a taste of first-team football, like last year, it’s a lot better than under-21 football. Hopefully I can get out and prove my point. “If you look at Chris Wood and Mirco Antenucci, you can’t fault them or the way they’ve played. They’re doing really well and they deserve to be in the team. I understand that. It’s just a learning curve for me. “I’ve got a lot to learn and I’ve always said that but I want to develop into a player who the club can use for the first team. Erwin’s presence in a Motherwell side who narrowly avoided relegation from the Scottish Premier League last season was his first run at a prominent level, a year on from a loan at Arbroath. He scored six goals and helped Motherwell through a relegation play-off against Rangers at the end of May, a two-legged tie which ended in a brawl involving Erwin and ex-Rangers defender Bilel Mohsni. Cellino had been in contact with the forward’s father in the week before the second leg and his move to Elland Road was agreed immediately after..
Erwin’s reputation as a footballer was that of a versatile striker with enough pace and creativity to play out wide. 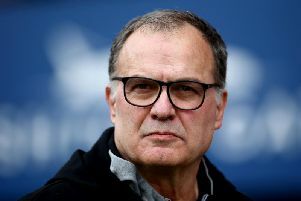 He displayed those traits at Thorp Arch yesterday, troubling the right side of QPR’s defence and converting two cut-backs from Doukara after half-time. Erwin said he hoped any loan deal would take him to another English club. “That’s definitely what I’m thinking,” he said. “I think that would be good for me. “I think I’ve improved as a player since I’ve come down to England. My all-round game’s improved. I’d say I’ve got sharper and stronger and I’m a bit more mature. I’m doing my own programme just now with Rushy (Sean Rush, United’s new fitness coach) and hopefully I should be up to scratch. “It’s been good so far. I’m just taking in the different environment and the different coaching. I knew I wasn’t going to be part of the first team straight away when I came in but I’m enjoying it. Doukara, who came off the bench in Leeds’ 3-0 defeat at Middlesbrough on Sunday, opened the scoring for United’s development squad yesterday, drilling a volley into the top corner after only two minutes. He, Erwin and youngster Frank Mulhern passed up a series of chances on an afternoon when Erwin admitted United “should have scored nine or 10.” QPR fought back from 3-1 down to claimed a draw six minutes from time through Osman Kakay’s left-footed finish. “The most important thing is that we didn’t get three points,” Erwin said. “If you score three goals then you should be winning the game.